Life is like a hurricane, here at GL; race cars, lasers, aeroplanes, and an incredibly-overwhelming urge to write an entire article to the tune of a popular cartoon theme song. Sometimes life just isn’t easy, although the same can’t be said of one Scrooge McDuck, a fabulously-wealthy mallard who literally swims in his giant pile of money and still manages to come out as one of the most affable and lovable members of the one percent. Part of that may be down to his iconic DuckTales (woo-oo!) cartoon, but it may also come down to his presence in the legendary NES and Game Boy titles of the same name. 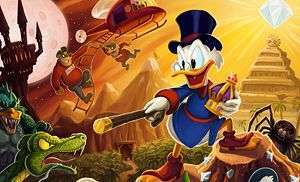 Brought to you by some of the same developers who gave us the Mega Man series, this classic saw Scrooge McDuck, his grandniece and grandnephews travel the globe in the pursuit of five great treasures to become the world’s richest duck ahead of his rival, the evil Flintheart Glomgold. At the time, it was one of Capcom’s most successful titles ever, and now thanks to WayForward Technologies – creators of critically acclaimed fare such as A Boy And His Blob, Aliens: Infestation and Adventure Time: Hey Ice King! Why’d You Steal Our Garbage?! – it has a chance to repeat that success all over again. The remastered DuckTales (woo-oo!) will still see Scrooge McDuck and family traverse the planet to find treasures and increase the billionaire’s net-worth by discovering a myriad of treasures, but it’s by no means a port or a simple update of the original. For one, the graphics have been given a complete overhaul – all of the environments and objects in the world are presented in three dimensions, while our hero, his companions and your enemies are all gloriously rendered in a familiar 2D cartoon style that makes them look even sharper than even their TV show counterparts. While melding the second and third dimension is nothing new, it works beautifully here and gives the action a really unique and striking look that’s hard not to appreciate. Another amazing touch is that – rather than just using text-boxes for dialogue – the official Disney voice actor for each character has been called in to provide their vocal talents, with members of the original cast of the animated series returning, including Alan Young as Scrooge McDuck. To this end, each level contains several cut-scenes that help expand the story that little bit more and add some more background as to why you’re exploring each locale. Though low-key, these scenes do plenty to add more personality to the proceedings, but their pacing could be a little tighter, as it feels like there’s just slightly too long a gap between each piece of dialogue. New art and voice-acting are all great additions, but those who’ve played the original to death will also find that some of the content has been remixed and expanded upon. In fact, about thirty percent of the content is brand new, with a new level specifically for the final boss, and Duckburg acting as a tutorial level for the players who want to get to grip with the basics. On top of all of this, the soundtrack has been given an overhaul as well, with the music throughout each level taking more than a few cues from that of the cartoon series. Each tune is ridiculously catchy, although none come close to the main theme tune, which is so iconic that Capcom’s booth at E3 had a Karaoke booth where fans were invited to sing-along throughout the duration of the expo, and still hasn’t left me weeks after the event (a recent dream consisted of nothing but people singing the theme tune over and over until I woke up singing it myself). This raft of additions and changes would all be for naught if gameplay wasn’t there to back it up, and it’s here that WayForward’s take on DuckTales (woo-oo!) shines brightest. Providing pixel-perfect platforming is difficult, but it’s evident how much hard work has gone into bringing the adventures of Scrooge McDuck back on to our screens, and everything feels well-paced and suitably challenging, to the point where I even found myself dying a few times throughout the demo and not even feeling remotely angry about it. 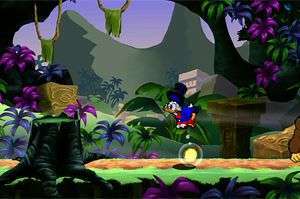 McDuck’s primary forms of making his way throughout the world are his trusty cane and pogo stick, the former used mostly to move objects around in the environment and the latter helping him dispose of his foes by bouncing on their heads and reaching areas inaccessible in a regular jump. Leaping around with the pogo stick does admittedly have a minor learning curve to it, but it takes no time at all to perfect it, and this remastering comes with the ability to toggle a new “easy pogo” mode that keeps Scrooge in a state of perpetual bounce as long as you hold down the button as you descend, rather than having to hold it down in conjunction with the d-pad. As someone who missed out on the original DuckTales (woo-oo! ), there were two things about my time with this remastering that particularly stood out to me – the wealth counter and the non-linearity of the levels I played. 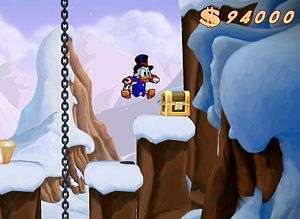 The first is a familiar-enough conceit; by exploring the nooks and crannies of each level, the player can uncover and collect more treasure to keep McDuck’s coffers full, with the idea that this will both fill up his aforementioned pit of money but allow players to unlock extras outside of the main gameplay. As well as this, the total amount of money accrued by the opulent mallard will help affect the ending, with a better finale awarded to those who collect a certain amount and also discover all of the hidden treasures. With this in mind, exploring the hidden depths of each location is vital for those who want to get the best conclusion, but the wealth counter alone had me scrambling to find everything I possibly could even though knew that I couldn’t take it with me when the demo was over. Helping matters significantly is that getting to the end isn’t just about moving from left to right until the level’s over, with the layouts feeling more intelligently designed and fun to play as a result; it felt amazing to experiment with the directions I could take throughout the Transylvania stage and, in doing so, coming across a mini-boss battle with one of the Beagle Boys felt more like an achievement for finding it than a necessary step to get to the end. Having missed out on the original NES version all those years ago, I was worried that I wouldn’t see the appeal in the remake, but after my time with it I’ve been compulsively singing the theme tune every day and impatiently waiting for its release, waiting for the day I can download it onto my Wii U so I can take advantage of the Off-TV play until everyone in my house is singing along. Combining a brilliant 2.5D art-style, a catchy soundtrack and some sublime platforming, DuckTales Remastered (woo-oo!) is going to be an amazing remake that will have you playing and singing the theme song for a long time to come. 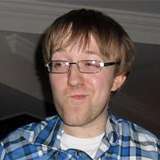 Tags: Capcom, classic games, Dolly Llama, Ducktales, E3 2013, E3 2013 preview, platform games, Scrooge McDuck, WayForward, Woo-oo! Great preview Ed. I love DuckTales (woo-hoo) I always have – got them on DVD – and I had this game. One of my fondest gaming memories.